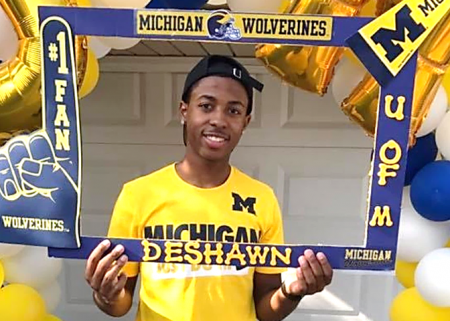 Deshawn just completed his freshman year at the University of Michigan and plans to be a nurse. I met Deshawn Wafer on a sunny afternoon at a local Starbucks. We talked about his time in our mentoring program at Harper Woods High School. He said he was lost. All I could do was stare at him in utter disbelief. Combine puberty with challenging academics and you’re sure to get some kids who feel lost. I was a teenager, many moons ago, so I get it. But that’s not Deshawn’s story. His is quite different. Deshawn’s high school career could easily be described as remarkable. He participated in several sports, including track where he still holds the school’s 200 and 400-meter dash records. He was vice president of the National Honor Society and president of his Senior Class. To top it all off, he earned straight A’s. Despite this Deshawn was lost, not knowing what his future held, or what to do with all that knowledge and skill. Dion Lockridge was a group leader at General Motors and joined our program as a mentor at Harper Woods High School. Deshawn was in his junior year. They quickly established a good rapport. Dion’s influence paid off. Armed with a vision and five-year plan, Deshawn earned a Winning Futures Cupp-Hamilton Scholarship and graduated as his school’s Salutatorian (that’s education lingo for “second in class”). He applied and was accepted to multiple universities with several additional scholarships. Deshawn just finished his freshman year at the University of Michigan where he is studying biopsychology, cognition, and neuroscience. He’s on course for nursing school and eventually plans to be a certified nurse anesthetist. Deshawn has a vision and a plan. He’s no longer lost. And we are very proud of him. The world is full of kids who need direction and support. With a little help, they can do great things. Interested in helping kids like Deshawn? We currently have two mentoring opportunities. The first is one-time, one-hour, in-class mentoring at the Shoot For Your Goals basketball and leadership development camp with Greg Kelser, July 16-19, 2018, at Cass Technical High School in Detroit. The other is our 2018-19 workforce prep mentoring program for which we are currently taking applications. Apply for one or both today!